Description: This image shows the Arctic as observed by the Advanced Microwave Scanning Radiometer for EOS (AMSR-E) aboard NASA’s Aqua satellite on September 16, 2007. 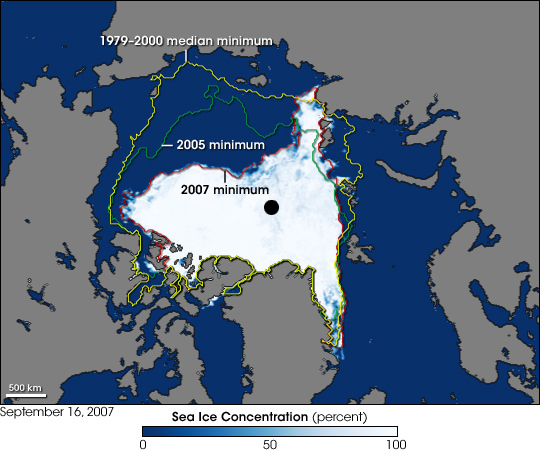 The image shows a record sea ice minimum in the Arctic. Author: NASA image created by Jesse Allen, using AMSR-E data courtesy of the National Snow and Ice Data (NSIDC), and sea ice extent contours courtesy of Terry Haran and Matt Savoie, NSIDC, based on Special Sensor Microwave Imager (SSM/I) data.